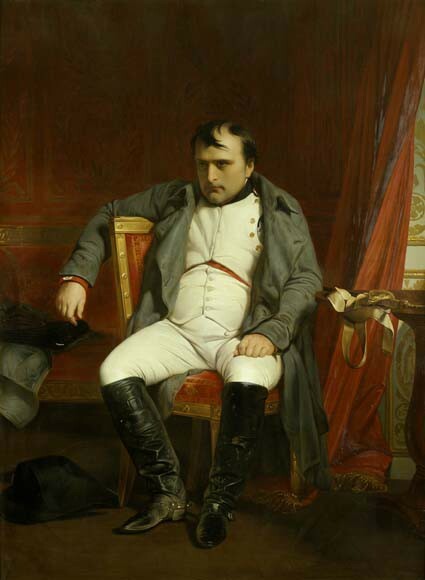 Often described as showing Napoleon at Fontainebleau after his first abdication, this icon of the imperial legend in fact shows the emperor several days before he performed that political act, indeed at the very moment where he realised that the wheel of fortune had turned. Some of the preparatory material for the painting exists, although unpublished and in private hands. The leaf in question, in Delaroche's hand, bears a transcription reworked of a passage from the Memoirs of Bourienne, Napoléon secretary. * The passage relating to the end of the French Campaign sheds light on the birth of the painting: ‘after having spent a part of the night at Froidmanteau “he repaired to Fontainebleau, where he arrived at six in the morning. He did not order the great apartments of the castle to be opened, but went up to his favourite little apartment, where he shut himself up, and remained alone during the whole of the 31st of March”, 1814. Just off his horse, his great coat and boots still spotted with mud, and his hat thrown on the ground, his papers case thrown on the divan, the emperor sits slumped in a chair, aghast at recent events. Defeated, and already abandoned by many of his erstwhile supporters, here he is alone in his private apartments in Fontainebleau, staring destiny in the face. He sees glory turns its back on him and understands that his fall is close. Seen in the light of Bourrienne's text and after close observation of the painting, the subject seems to have much more dramatic tension than is usually believed. The choice of such a key, transitional moment of introspection is typical of Delaroche, who himself was a history painter of unsettled nature and who was to suffer increasingly from depression. Indeed, he was fascinated by Napoleon and painted the first consul and then emperor several times at different moments in his career, in works which seem to follow the destiny of the Consulate and the Empire, from rise, to fall, to the birth of the legend. Several versions of the painting are known, but that most frequently reproduced is the work belonging to the Leipzig Museum der Bildenden Künste, dated 1845, and often incorrectly identified as the original of this celebrated composition. That here, dated 1840, could have been painted on the occasion of the return of Napoleon's body, just like Horace Vernet's, Napoleon rising from his tomb, widely reproduced in engraving form. However, unlike Vernet's glorious image, done in small format, that by Delaroche shows the emperor as an anti-hero, in a banal pose but transposed into the large format, traditionally the domain of history painting in the grand style. It was bought in Paris by the British collector, John Naylor, in 1852, whence it became part of the Naylor collection, held at Leighton Hall (Montgomeryshire). It was subsequently bought by Francis Howard, who then donated it to the Musée de l'Armée in 1954.